This easy apple cranberry pie is the perfect pie for a novice baker. 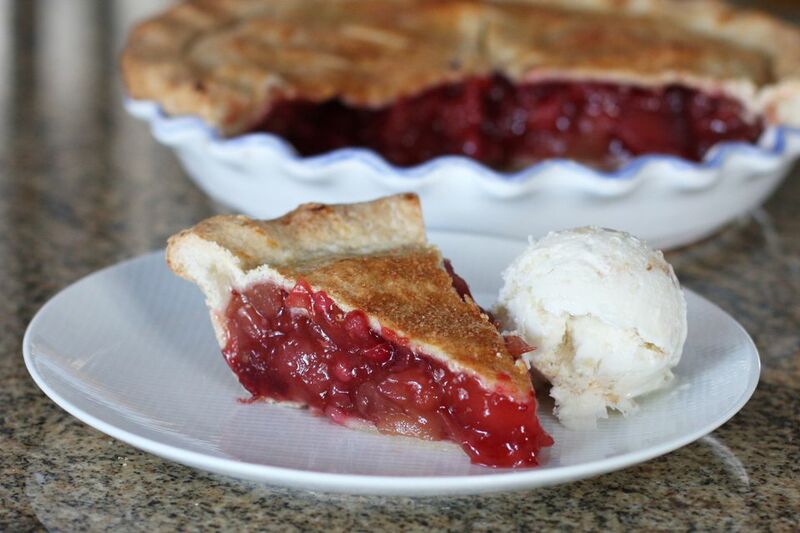 If you have to bring a pie but hate to bake, this is a delicious solution. Use canned apple pie filling or a homemade apple pie filling for this easy dessert. The homemade crust with a touch of buttermilk brings it all together to make it an extra special pie. Or use packaged pie pastry sheets. You can make the crust a day in advance and keep it in the refrigerator until you're ready to fill and bake the pie. Combine the flour, sugar, and salt, whisking or processing in a food processor with metal blade. Add the chilled butter and cut in by hand with fingers, or pastry blender, or pulse in the food processor, about 10 to 12 times. The mixture should look like crumbs with some pieces about the size of small peas. If using a food processor, transfer the mixture to a large bowl. Combine 4 tablespoons of buttermilk with the 2 teaspoons of vanilla. Using your hands, toss the buttermilk with the flour and butter mixture to moisten evenly. Add more buttermilk in small amounts until the mixture begins to clump together. Turn out onto a lightly floured surface, and with moistened hands knead a few times until the dough comes together. It shouldn't be too moist, but should hold together. Divide into two portions about 12 ounces each and shape into disks. Wrap in plastic wrap and refrigerate for at least 30 minutes. Pour the 2 cans of apple pie filling into a saucepan with the 1/4 cup of brown sugar, 1 teaspoon vanilla, 1/4 teaspoon of cinnamon, and cornstarch. Bring to a simmer, stirring constantly. Cook, stirring, for about 1 minute. Stir in the cranberry sauce and set aside to cool. *If making the pie with a homemade apple pie filling, omit the 1/4 cup of brown sugar, 1 teaspoon of vanilla, 1/4 teaspoon of cinnamon, and the cornstarch. Combine the homemade filling with the cranberry sauce and set aside to cool. Roll one disk of chilled dough out on a lightly floured surface to a circle about 12 to 14 inches in diameter. Use wax paper or parchment paper over the dough as you roll to keep excess flour to a minimum. Fit the dough into a pie dish. Spoon the filling into the pastry-lined pie dish. Repeat the rolling with the second disk of dough. Lightly brush the overhang of the bottom crust with a little milk. Top the pie with the rolled out pastry. Trim excess overhang, leaving about 1 inch for a nice edge. Press the top and bottom overhangs together lightly and fold the overhang under to form the crust edge. Crimp and flute as desired. Chill the filled pie for 20 minutes. Heat the oven to 425° F. Place a large empty baking sheet in the oven. This is to help the bottom of the pie bake a little more quickly and to help catch drips. Combine 1 egg yolk with 1 tablespoon of milk. Brush lightly over the top crust. Sprinkle with cinnamon sugar, vanilla sugar, or decorating sugar. Cut several slits in the top crust. Bake for 20 minutes. Reduce the oven temperature to 375° F and continue baking for 30 to 40 minutes longer. Watch the pie for over-browning and tent with foil or use a pie shield or foil ring if necessary.